Wild Buffalo Bayou, a ribbon of life, as it flows past Memorial Park, on the left, in the center of Houston. Photo by Jim Olive. On April 19, 2017, the Corps of Engineers issued a permit that grants an exception to the Clean Water Act and allows the Harris County Flood Control District to destroy our beautiful Buffalo Bayou. The Corps, without legal basis, initially refused to send us the formal Environmental Assessment of the impact of the project required by the National Environmental Policy Act. We first asked for this important public document on April 6, 2017, through the Freedom of Information Act. On May 16, 2017, the Corps finally sent us the Environmental Assessment. Absurdly, the Corps found that the project would have “no significant impact” on the environment. Read the Environmental Assessment here and let us know what you think. In the meantime, the flood control district now says that the project will cost some $12 million — double the original estimate. What to do now: Write or call Precinct 4 Commissioner Jack Cagle. It’s his territory and he’s in charge. Write or call your own county commissioner. City and county taxpayers are going to have to fork up a lot more money for this wasteful, pointless project to eliminate a rare, public natural asset in the middle of the city. Write or call the mayor and your council member and say no. This is using public funds for private benefit and public detriment. And write or call the Memorial Park Conservancy. They are supposed to be protecting Memorial Park. Contact the Houston Parks Board. They are supposed to be advising the city council and parks and recreation department. Tell them to put their Bayou Greenways hike and bike trail through the nice woods along the east-west power line easement, rather than along the forested bank of the bayou in Memorial Park. And let your federal representatives know that the Corps of Engineers is not doing its job protecting our wetlands and waterways. Contact the Houston Parks Board. They are supposed to be advising the city council and parks and recreation department. Tell them to put their Bayou Greenways hike and bike trail through the woods along the east-west power line easement, rather than along the forested bank of the bayou in Memorial Park. Nature is a public trust, and we are obligated to protect it. Here’s a link to the permit, which despite years of delay, protest, and criticism, contains basically the same old unscientific and contradictory plan that it’s been all along. We have good reason to believe that it will fail. Also please donate. We need your support to fight this. Here are the Top Eleven Phony Arguments they make for destroying our wild bayou and How to Answer. Destroying riparian forest buffer is exactly the wrong thing to do for stabilizing the banks, controlling erosion, and removing sediment, bacteria, and pollution from the bayou. This expensive, wasteful, experimental “demonstration” project is showing landowners on the banks of Buffalo Bayou exactly what they SHOULD NOT DO to protect their property from erosion. The City and County should emphasize best management practices to landowners on the bayou, including preserving and enhancing natural riparian vegetation and not disturbing the banks, cutting grass, or building paths or roadways. It is not a proper use or taking of our unique public parkland to conduct an experiment on our wild bayou to see if controversial techniques that often fail might work here. The City and County are wasting millions in taxpayer funds to destroy a valuable public resource and subsidize the renovation of the River Oaks Country Club golf course. The project violates federal and state policy protecting and enhancing riparian buffer, which is vital to the health and functioning of waterways. The plan will destroy riparian buffer by removing vegetation from about 80% of the stream length for nearly 1.5 miles. The removal of shading canopy will raise the stream temperature and impact the ability of the stream to support wildlife. The Natural Channel Design methodology being proposed is controversial, expensive, has a high failure rate, and is not appropriate for Buffalo Bayou. Notably, in 2009 Dave Rosgen, the author of Natural Channel Design, described this section of the bayou as natural, functioning, and stable. The proposed plan needlessly kills hundreds if not thousands of trees. Memorial Park lost more than half its trees to the drought. Some of the trees in the area targeted for destruction may be 100 years old or more. The plan will damage wetlands, vital wildlife habitat, and destroy the bayou’s ecosystem. Demand an Environmental Impact Statement. This project will destroy an historic natural area that should be preserved. This area, relatively undisturbed for almost 100 years, includes high cliffs thousands of years old, 750,000-year-old sandstone formations, natural springs and clay banks, and magnificent trees. Buffalo Bayou is 18,000 years old, and this woodland stretch has never been channelized. Camp Logan in Memorial Park, which includes banks of the bayou, is a State Antiquities Landmark and eligible for the National Historic Register. There are solutions for erosion problems that are much less destructive, and the federal Clean Water Act requires the least damaging solution. A least damaging solution would be to leave the bayou alone to adjust and heal itself, as recommended in the 2004 Memorial Park Conservation Master Plan, and to focus on the causes of erosion and bank failure. Though we had hoped that the many sound and scientific arguments against the bayou destruction project were enough to dissuade its promoters, the discouraging word is that the project still appears to be undead. The Army Corps of Engineers reports that an Environmental Assessment has been completed, as required by the National Environmental Policy Act. Dwayne Johnson, regulatory project manager for the Corps’ Galveston District, says the Office of Counsel is conducting a legal review of the assessment. An Environmental Assessment would result in either a Finding of No Significant Impact or a requirement that the Harris County Flood Control District conduct a full and costly Environmental Impact Statement. Johnson could not say when or if an announcement would be made about the decision. The Memorial Park Conservancy continues to promote the project as does the Bayou Preservation Association. The Conservancy in December hired as its conservation manager Carolyn White, who worked for the flood control district for ten years, most recently as a project manager in the Environmental Services Division. Contact the Memorial Park Conservancy to let the board know what you think about the proposal to raze the bayou forest in the park, fill in a meander, level ancient high banks, dredge, reroute and rebuild the channel and banks, and plant it all with turf grass. The board chairman is Steve Jenkins. Also contact the Bayou Preservation Association as well as your county and city representatives. The second period for public comment to the Army Corps of Engineers about the proposed project to bulldoze our wild Buffalo Bayou closed June 5, 2015. During the first public comment period last spring, several hundred comments were sent to the Corps, the vast majority of them critical or flat out opposed to the Harris County Flood Control District’s plan to destroy and rebuild one of the last natural stretches of Buffalo Bayou in Houston. This time around the comment period was shorter (thirty days as opposed to sixty days) and little publicized. Still, comments opposing the project vastly outnumbered comments supporting it. There were more than fifty comments critical of the project, including from public agencies such as the Environmental Protection Agency, the US Fish and Wildlife Service, and the Texas Commission on Environmental Quality. There were only two in support—one from the River Oaks Country Club and the other from the Bayou Preservation Association, which, shockingly, initiated this project several years ago. Armoring with concrete rip rap and dirt a south bank of Buffalo Bayou by the River Oaks Country Club. Photo taken Aug. 7, 2015, at very low water. The next move is up to the Corps. 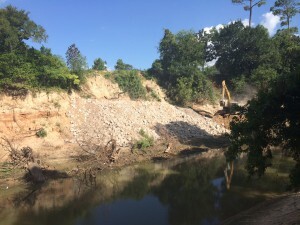 In the meantime, the River Oaks Country Club, which owns the entire south bank of the project area, has lost patience and armored two of its steep banks with rip rap and dirt. Talk to as many people as you can about this. See What to Say at the bottom of this page for points to make. Let your city and county representatives know what you think. Tell the mayor, the parks department, the parks board, and the Harris County Flood Control District. (The flood control district has a comment form on its Memorial Park Demonstration Project page.) Tell the Memorial Park Conservancy, since they support this project, and the Bayou Preservation Association, which not only initiated the project but also continues to promote it. Download a flyer from our website and hand it out. You can also distribute a Plain Facts sheet, and the Top Eleven Phony Arguments in favor of the project and the right answers. The Harris County Flood Control District has revised its plan to strip the riparian forest, grade, dredge, shorten, and reroute one of the last natural stretches of Buffalo Bayou as it flows past Memorial Park. These revisions were made in response to comments and criticisms of the district’s so-called “restoration” project made during the initial public comment period last May and June. The Army Corps of Engineers, which is considering whether to issue a permit for the project, announced on May 5, 2015, a new public comment period on the flood control district’s revised plan. The public now has until June 5 to comment on the new plan and on the flood control district’s responses to the overwhelmingly negative comments to the original plan. Here is where you can view the revised plan. Here is where you can read the flood control district’s recent responses to comments about the original proposal. And here are the district’s complete responses released on October 8, 2014. Our view is that this project, known as the Memorial Park Demonstration Project, is a pointless, expensive boondoggle that is needlessly destroying a healthy, natural, historic stretch of the river (and natural flood detention area) in order to re-engineer it with dubious methods that often fail. Rather than making the banks more stable, the project will de-stabilize the banks and cause greater erosion both within the project area and downstream. Rivers erode and regenerate their banks. We are in favor of letting this river be a river. It’s an invaluable public asset in the middle of the city. This proposed project violates every Best Management Practice for riparian zones and demonstrates to landowners on the bayou exactly the wrong thing to do for controlling erosion of their property. Landowners have problems with erosion when they remove the trees and vegetation along the banks of the bayou (the riparian buffer). That’s what this misguided project is proposing to do. Let’s work with nature, not against it. In your comments be sure to reference file number SWG-2012-01007. Ask for more time to comment, for a public hearing, and for an environmental impact statement that takes into account the cumulative effect of all the flood control projects on Buffalo Bayou, the operation of the Addicks and Barker dams, development, and increasing impermeable surface in the watershed. Demand scientific evidence that this project is necessary and would achieve its goals, and that the methods proposed work. The law requires a more practicable, less damaging solution. Say that a more practicable, less damaging solution would be for better, more natural detention methods up and downstream and for private landowners in the project area to protect their banks by practicing better land management for riparian zones. Send a copy of your comments to the Texas Commission on Environmental Quality. The TCEQ, which asked critical questions about the project in its comments to the Corps, must certify that the project complies with state water quality standards. And tell everyone you know what is happening. The Army Corps of Engineers reports that it is continuing to supply the Harris County Flood Control District with their comments on the Flood Control District’s responses to the public comments on the district’s application for a federal permit. Dwayne Johnson, regulatory project manager for the Galveston District office of the Corps, wrote in an email to Save Buffalo Bayou on Jan. 20, 2015, that the Corps expects to have a response and a possible new Public Notice about the permit application within thirty to sixty days. The new Public Notice would request new public comments only on the changes to the project plans made since the original Public Notice last April, said Johnson. A federal Clean Water Act permit is required for the project because it will dredge and fill navigable waters of the United States. The Corps is responsible for that. The Texas Commission on Environmental Quality must certify that the Corps’ permit meets Texas Surface Water Quality Standards. The Environmental Protection Agency also has the authority under the Clean Water Act to overrule a federal permit, although the EPA has rarely done that. In addition, the Houston City Council, as the governing body for Memorial Park, must give public notice, hold a hearing, and vote on whether the project is a proper use or taking of public parkland under Ch. 26 of the state Parks and Wildlife Code. Memorial Park has some protection from the deeds establishing the park. The Hogg Family, which sold the parkland to the city at cost in the early 1920s, set up the multiple deeds so that ownership of the park reverts to their heirs if the land is used for other than park purposes. These reversionary rights have been left to the Daughters of the Republic of Texas and the Hogg Foundation for Mental Health. Plus, the City of Houston Floodplain Management Office must issue a development permit for the project because it involves construction activity within a city floodplain. Find out what is happening and what else you can do now about the $6 million plan to bulldoze the riparian forest and dredge and channelize the last remaining natural stretch of Buffalo Bayou in Houston. Read our latest post about who needs to do what and when. The Harris County Flood District has posted online its responses to comments (caution: big pdf) made about the destruction project to the Army Corps of Engineers during the public comment period. The Corps is now considering whether to approve or deny a permit to allow the flood control district to bulldoze the beautiful wild banks of Buffalo Bayou in the middle of our city. The period for public comment on the permit application (warning: big pdf file) closed on June 30. But we should continue to tell the Corps, as well as the flood control district, the mayor and Houston City Council, Harris County commissioners, the Bayou Preservation Association, the Memorial Park Conservancy, and others that we oppose the plan to destroy our majestic prehistoric cliffs and one of the last remaining riparian forests in Houston. Tell them the people demand a better plan that protects our mysterious, slow-moving bayou, enhances the natural ecosystem, and preserves wildlife. 1. Talk to your friends and neighbors about what is happening. Most people don’t know about this. And many who think they do don’t realize the extent of the destruction that is planned. Raise awareness! Download a flyer, print a bunch, and pass them out. 2. Write to US Representatives John Culberson and Ted Poe and tell them Harris County’s plan is a senseless and destructive use of taxpayer money. They have the power! Here is their contact information. 3. Tell Mayor Sylvester Turner, the Houston City Council, Harris County Commissioners, the Houston Parks and Recreation Department, and the Memorial Park Conservancy you are against destroying our wild and unique southern bayou, a valuable public resource in the middle of our city. How to contact. 4. Donate to Save Buffalo Bayou. We are building a legal fund for the inevitable challenge to the project permit that the Army Corps of Engineers is likely to grant. (The Corps rarely turns down a permit.) We must also file an injunction to stop to the flood control district from immediately starting to bulldoze our park and forest. Funds will also go towards the development of plans to make sure this never happens again and programs to educate the public and our political and civic leaders about best land management practices on and around our streams. See our Mission Statement. I am writing to request a 60 day extension of the period for public comment on the proposed removal of the forest habitat along Buffalo Bayou. It is vital to protect the remaining natural habitat. The city must consider the impact on flood control, the historical importance of the habitat. Why is this removal necessary? If it isn’t necessary then why are we even considering it? Has any study been made that says otherwise? Excellent comment. Thanks. Please be sure to comment on the editorial about this in the Chronicle this morning! Please consider how bulldozing Buffalo Bayou banks will do irreparable damage to our special urban gift of this special waterway to Houston. Once the change is made, there can be no restoration of this unique scenery created for our enjoyment. Please give careful thought to the potential action of the human altering of this natural gift. Please, please grant the 60 day extension. Or better yet – DON’T DESTROY THE HABITAT ALONG BUFFALO BAYOU. By email to Save Buffalo Bayou from Karen Kuper. I want to add my name to the list of concerned citizens who would like the Corps of Engineers to initiate a 60 day extension (or longer) of the May 30 deadline to receive public comment. This project appears totally unnecessary and will create worse problems downstream. This project will adversely impact vegetation, animal life and water quality of the bayou as well as the Hogg Bird Sanctuary. Our city is turning into concrete at an unprecedented rate, and we need the bayou as a respite for people, birds, wildlife and flora. A review of the application needs to be done. There is better river science than what is being proposed. Removal of the canopy due to tree loss will raise the temperature of the bayou and adversely affect fish, etc. The Corps should reevaluate alternatives to the NCD for a more natural setting at much less cost. We do NOT want Buffalo Bayou to look like the bayou by Hobby Airport. Please, please reconsider this project, and at the least grant a 60 day extension of the May 30 deadline for public comment. I request the Corps to also hold a public hearing on the application, and by copy of this letter, I request the TCEQ hold a public hearing in Houston to consider the impacts of this proposed project. banks of Buffalo Bayou elsewhere, in an area that is less environmentally sensitive? during flood stage or when USACE is releasing storm water from the the dams. of controlling erosion is circumspect. It just does not make sense. In fact, the Harris County Flood Control District has already done several Natural Stable Channel Design projects. And they have had problems. See also here. Don’t think they plan to plant dead trees. But you are correct about the ability of planted trees to withstand the conditions in the bayou. The district is grossly overestimating the survival rate of trees they plan to plant — claiming there will be an 80 percent survival rate. Other experts warn the normal survival rate is closer to 10 percent. But basically they will be covering the denuded, rebuilt banks in turf grass. The bayou has its own intelligent planting methods and plan. It prepares the bank first with the proper type of plants that miraculously turns sand into soil, and then plants small native trees when the soil is ready. It all works much better. I want to protest the continual destruction of nature. I find it incredible we can’t seem to get past this issue. We spend more time debating what seems like almost surely an issue that was resolved long ago legally with George Bush and Terry Hershey. It makes no sense to continue to struggle with it. What does make sense is getting rid of all those junk yards North of Clay Road on Gessner. Have Brittmoore Road cleaned up, too. We look like a third world country. Greenhouse Road at Park Row where the Addicks Dam is a mere beginning is a perfect place to get onto the Dam for a bike ride. And I don’t accept the policy trails have to be concrete. It ruins the experience completely for those who want a nature ride. I would be much more proud of my city if they stopped jumping to conclusions like engineers and took care of the real pollution problems like old rusty used car lots, metal recycling, and important things near waterways. It makes me suspicious when I see clearing near waterways and not natural growth. Are they trying to use it a a dumping channel specifically lined or what? For Flood Control this is just cover to go in and dig up the bayou to “improve conveyance.” This approach is outdated. The most enlightened policy makers in the rest of the world don’t do this any more. They focus on stopping, slowing, and soaking up stormwaters before they hit our streams. They recognize the importance of our waterways and the vital function that vegetation plays in cleansing and filtering stormwater and runoff.